Croatia and other countries of the former Yugoslavia are making a rich contribution to contemporary culture, especially theatre and film. Thanks to the National Theatre, we can see for ourselves. Tena Štivičić has wrought an ambitious and complex insight into present-day Croatia, showing how the past is ever present and yet needs to be left behind. Inspired by her own family history, 3 Winters is set in the Kos family home, a seemingly stable hearth in the whirling storm of social and political change. Using the family house as a metaphor, she reveals how the state and property relations willy-nilly shape personal history – and questions whether this should be so. Making generous use of the National’s stagecraft, including film projections by Jon Driscoll that accompanies Dominc Muldowney’s lilting post-Hapsburg-empire music, all the parts are gathered for a stirring journey through time. Through contemporary film and photos, the dramatic events that brought the new state of Yugoslavia into being in 1945 are overlaid on to an aristocratic family’s front room. But it turns out that not all the previous owners have abandoned their home. The aristocratic Karolina (Hermione Gulliford/Susan Engel) will haunt the new tenants for years to come. Fast forward to 1990, the year when Yugoslavia is dissolved. Croatia declares independence and civil war breaks out as Serbia seeks to retain control. But, while the historic changes determine their lives, the real focus is on family tensions and squabbles and how successive generations of women negotiate their marriages. The quietly stoic Masha Kos (Siobhan Finneran) has spent her life serving her garrulous and ineffective husband Vlado, amusingly played by Adrian Rawlins. Her sister Dunya (Lucy Black) is back on a visit from Germany, where she lives in relative luxury, but remains bitter about her alcoholic husband, Karl (Daniel Flynn). 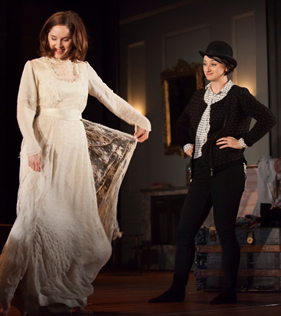 In the third act set in 2011, events climax with the impending wedding of granddaughter Lucia (Sophie Rundle) to her nouveau-riche fiancé in the new market-driven economy, much to the disgust of her mercurial sister Alisa, brilliantly brought to life by Jodie McNee. Under a Ministry of Culture directive, libraries were cleansed of any “inappropriate” books, including Cyrillic, Serbian, communist and ‘left-wing’ texts, which even included Shakespeare. Ugrešić notes the acute sense of disenfranchisement in the “current post-democratic societies” of former Yugoslavia, where the new democracy does not translate into a truly human existence. The driving force is how each generation of women leaves behind her mother’s world with new expectations and moralities. It is through the restless, angry character of Alisa (who like the playwright herself – has settled in London) that we experience a dramatic conflict. As the sisters argue about the house, Alicia and Lucia, we feel that there is still some history to come. Is the bride-to-be’s pragmatic, hard-as-nails-choice the right one? With all its faults, it seems that her parents’ marriage was based on real love, whereas Alisa’s marital choice involves evicting her family’s fellow tenants as Croatia prepares for European Union membership. 3 Winters by Tena Štivičić and directed by Howard Davies had its world premiere at the Lyttleton, National Theatre, Southbank on December 3. It runs until 3 February.